If you have an internet connection, you have heard of Amazon.com. Haven't heard of them? Close your web browser. For those of you still with me, you probably now the ginormity (yup, I made that word up) of Amazon. They have products in every category imaginable, sell apps for smartphones, have movie rentals, MP3 downloads, and even offer staple grocery buying. Whats more, they have the cheapest prices the vast majority of the time, ship their products at the speed of light and have been around since the birth of the net for commercial use. When you think of ecommerce, you should think of Amazon. If you have an account on Amazon (refer to the first 3 sentences of this post if you don't), you have no doubt witnessed the phenomenal job they do recommending products to you based on your likes/dislikes. All of this is done by mining tons of data about you, the products you view on their site, the products you add/remove from your cart/wishlist, and ultimately the items you buy. With this data, they use algorithms to see what you are interested in and make offers to you. It's like a store that was built just for you and only you. Who wouldn't want to shop there? Add the free 2-day shipping with amazon prime, and low prices, and you have no reason to leave your desk! On The Verge Of Buying? They'll Up-sell & Close The Deal. 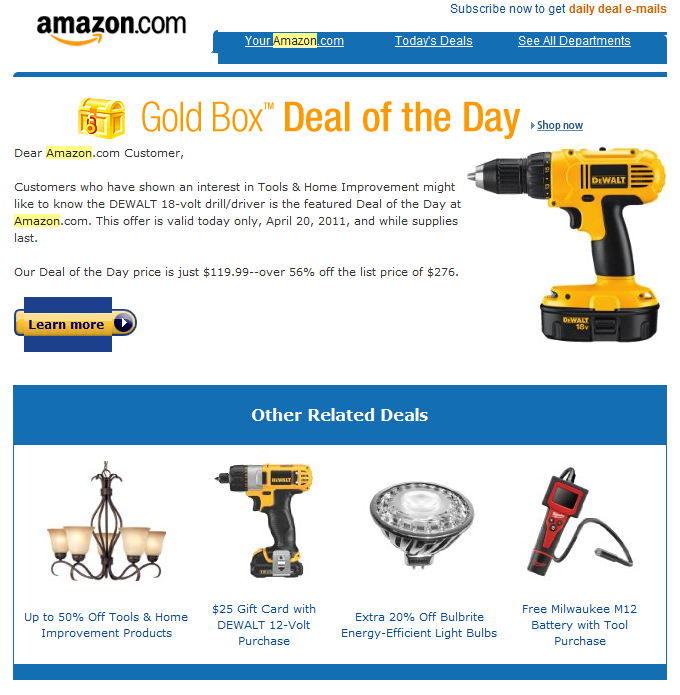 If you have visited Amazon's site in the past and added things to your cart that sit there for a day or so without a purchase, Amazon sees you as a lead that needs converted. They will go to great lengths to get you to pull the trigger. 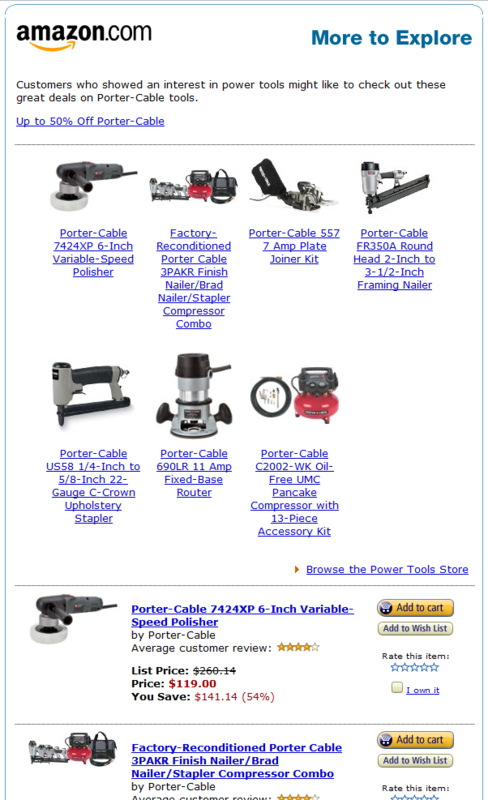 Recently, I was shopping for a new cordless drill. Pretty simple and strait forward. The drill I was looking to replace was a lower end drill that served it's purpose, but I have had it for almost 10 years and it is starting to smell funny when I use it (burning smell) and occasionally the motor smokes. Can't be good. 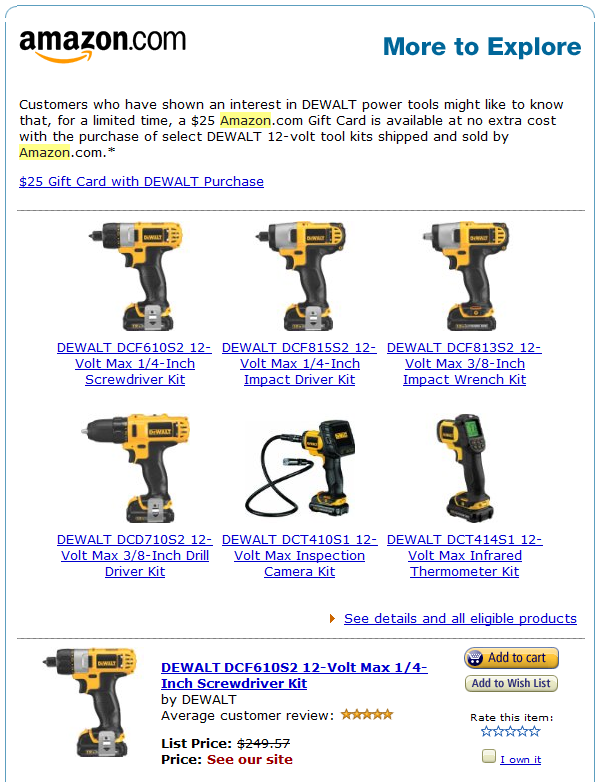 Having just built a house, I noticed many of the contractors used Dewalt tools and swore by them. In fact, many of them made fun of me with my little Black and Decker drill while I was wiring for Internet/TV/Phone. I had the opportunity to use a couple of their Dewalt tools, and I was utterly amazed at the quality and power of the cordless products. 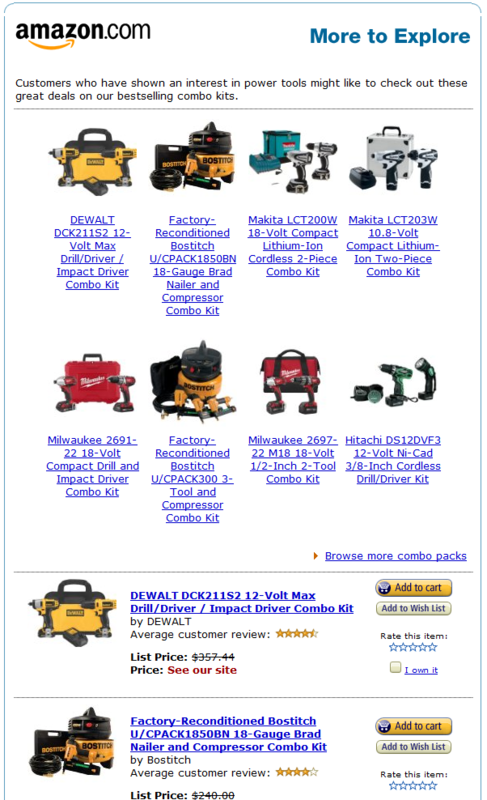 Needless to say, I started looking at Dewalt drills immediately. I added a couple of them to my cart so I could read reviews and compare them (right on Amazon), and ended up getting pulled away from my computer for one reason or another. I though to myself, heck yeah, I'll take 25.00 when I buy a tool! They even put Add to cart buttons right in the email. 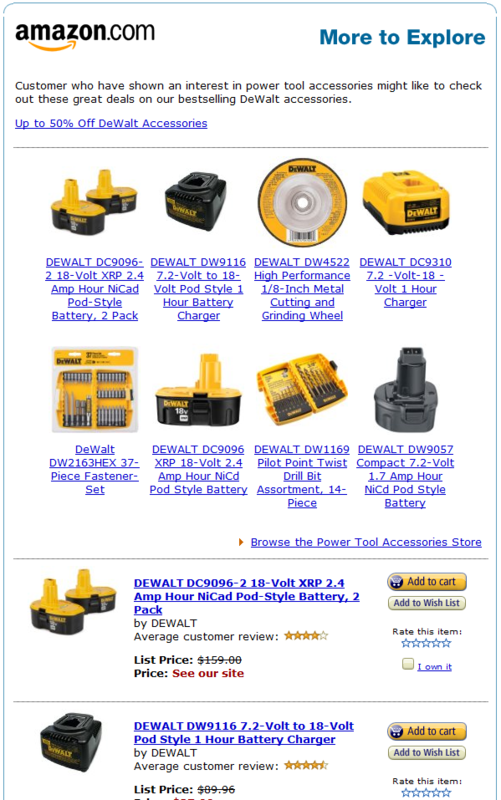 I clicked through the email and visited the site, adding and removing items in my cart. Again, I didn't buy anything. I clicked through, decided I didn't want that particular drill, looked around a bit more, and left again. This one really sparked my interest as I definitely lack in the power tool department. I again clicked through. This time however, I removed the drills I had in my cart, and added a couple combo kits so I could read reviews and compare them. The total was larger than if I bought a drill only, but I saw the value in the kits, and the price break was even better than on the drills. It was a bigger buying decision, so I had to think about it. It's like they knew that I was almost sold, but needed one more thing to sweeten the deal. At this point I had fully caught on to what they were doing. I decided to add the batteries to my cart to see if they were indeed free. They were not. I had to remove the kit I was looking at and add the same kit - sold directly from amazon. The initial kit I looked at was $6 cheaper, but sold by one of their affiliates. The batteries were a $95 value, so I quickly swapped the kits. Instead of pushing more DeWalt items on me, they decided to offer me another decent quality power tool brand that is cheaper. 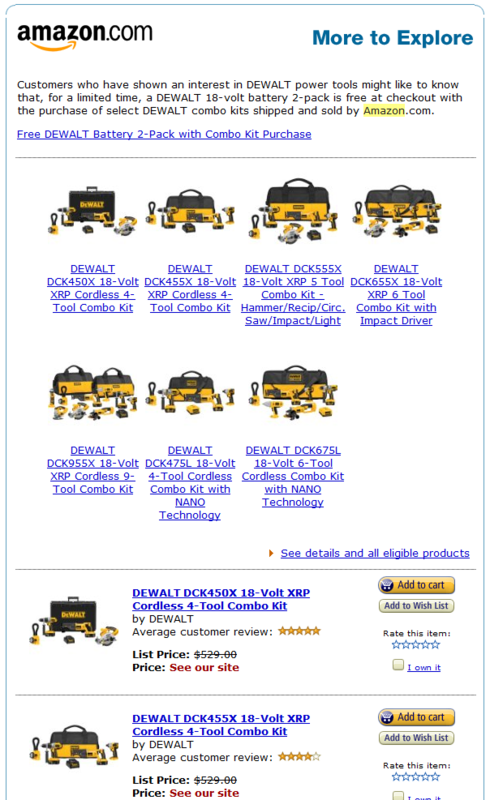 That day, I bought the DeWalt items in my cart. The greatest part about their persistence was that their emails were all automated. This sounds like a very difficult thing to do. It's not. Consider your own business. Most of the businesses that we work with don't sell an entire shopping mall's worth of products. They sell their own set of products/services. This makes it much easier to account for the possibilities and target buyers even easier. All Amazon did was take a look at what was in my shopping cart and make offers to close the deal. e80, our ecommerce platform, stores shopping cart contents in a database that would easily allow us to send offers to the shopping cart holder if needed. The process is quite simple. The key to Amazon's process was that they never gave up. What's even better is they never even spoke to me. They simply sent me highly targeted emails every day that I showed interest (also very easily trackable) by browsing the category they were marketing to me. Eventually, the closed the deal and upsold me. One of the services we provide is the gathering, analysis and reporting of web analytics data. We often hear responses to us offering these services that dismiss the value, such as "We can view Google Analytics data whenever we want.". Our follow-up question is almost always, Do you know how to act on the data? An even simpler question is, What is an acceptable bounce rate and time on site for companies in your industry? Often, the prospect or client doesn't even know what a bounce rate is, let alone how to use that data. In this Amazon example, they are not only using general web stats that you would get from Google Analytics, they are also using their own data to spark events. For example, the data they have on unprocessed shopping carts in certain product categories for certain periods of time can spark the event to send email promotions to get that shopping cart order closed. It's a much more active sales process and most of it is automated. If you'd like to evaluate some options for automated offers and using data points to grow sales on your website, please contact us. We'd be happy to meet with you to look at the options and do some brainstorming.